WHAT WE FILIPINOS SHOULD KNOW: It seems that there is less appreciation of Filipino nationalism among the younger generations, i.e. born during the Marcos Dictatorship and later. It is understandable, but not comforting, since the so-called leadership in business and government does not exemplify nationalism, as it has been dominated by Filipinos with foreign minds. It is understandable, but disastrous for the country in the long run, since this same leadership has been remaking the educational system to reflect this mendicacy and subservience to foreign interests. It is understandable, but destructive to our own heritage, since the foreign cultural influences by the West (mainly American in our case) which have molded us for decades continue unquestioned; and now by new though minor distractions, i.e. Korean. All are further bolstered and facilitated by globalized media. We Filipinos have always bought and thought that "being westernized is being modernized", when in reality the latter we are not yet; in contrast to the Chinese in China or the Japanese for example, who are quickly modernizing or modernized respectively, but without allowing to be overwhelmingly westernized. The lack of character and integrity, as demonstrated by the systemic corruption (among many others) in business and government attest to and are symptoms of the absence of Filipino nationalism, which simply translates into a lack of honest concern and action for the benefit of the present majority and our future generations. Hereunder is an article written by a Malaysian professor on the "why, what and how" to instill and promote (Malaysian) nationalism within its borders. 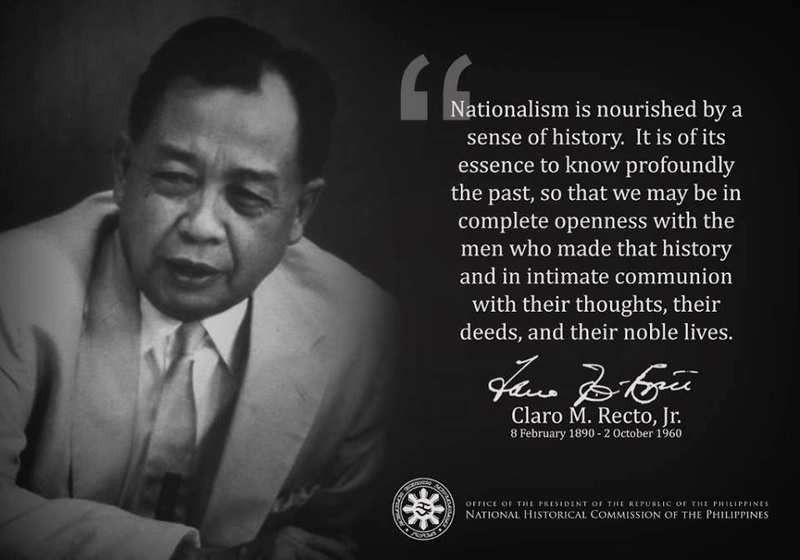 It is a good reminder and a good source for eclectically borrowing some thoughts for instilling Filipino nationalism among our young. A NATION is built, not born. Nationalism is man-made and national identity is an imaginary construction. It is important for us to understand this premise before we can begin to talk of the kind of human intervention we call nation-building. Nation-building is a process of becoming, not a state of being; and so in order for a nation to become, it cannot be a stable, unchangeable, God-given category. It can best be understood by looking at what has happened in history to see how nations were created where before none existed. The French Revolution of the 18th century precipitated what has since been called in learned circles as nation-states. This was done by skilfully transforming several dynasties into national look-alikes, sharing the same government, the same code of laws, the same class interests, more or less the same cultural system and more or less the same economic conditions. The French model then became the template for other nation-states across Europe. The same thing happened to us here. We were once sultanates until we were federated under the British and almost became a Malayan nation through a unitary state project called the Malayan Union, if not for the intervention of Malay nationalists who wanted, instead, a federalist concept of a united Malay government officially known as Persekutuan Tanah Melayu. Now after four decades of Independence, we are back with another unitary state project for a united Malaysian nation, Bangsa Malaysia. The other side of the changing face of nationhood is, of course, the break-up of once-upon-a-time solid nations under the weight of separatist struggles by ethnic groups within their national boundaries. The map of the Soviet Union and Eastern Europe has changed as a result of this. So has the map of Indonesia when East Timor recently ceased to be part of Bangsa Indonesia. The Philippines is still struggling to keep a chunk of nationhood in the South from breaking away. As you can see, nations change as boundaries are drawn, redrawn or withdrawn. But even within finite boundaries, the concept of the nation can still be quite unstable. The American nation within the boundaries of the United States of America, for instance, is not an uncontested category. Proponents of Western civilisation and Eurocentrism say that USA is a branch of European civilisation because they claim it accords with the facts of history. On the other hand, afrocentric theorists argue for pan-ethnic unity of all black people of the diaspora, pointing to the origins of African people in what they call the special reality of Africa. What about nations without boundaries which are now in the process of becoming, according to upholders of the one-world thesis and believers of universal civilisation. In fact, it is the prophecy of Marx, Weber and Durkheim that globalisation tendencies of capitalism and modernisation will transform the diverse form of human culture eventually into a homogeneous population living in what Marshall McLuhan is later to call global village. Instant communication and the simultaneous direct transmission of media events have virtually thrown all the media consumers of this shrinking planet into global sameness. We need to remind ourselves of the instability of the concept of nation and nationhood and the danger of treating social groups as stable or homogenous entities. These groups have their own dynamics which are subject to change, contradiction, variability and revision within historically specific and determinate contexts. That is why there are many definitions but no consensus on what constitutes a nation. The political definition sees the nation as a convenient functional mechanism for creating social and economic space required by modern industrialisation. The cultural definition is less concerned with state-formation and more with social formation. It relates the concept of nationhood to the psychological need to define oneself in terms of membership to a given community. This includes a sharing of tradition, language, literature, common meanings and memories, and common friends and enemies. The postcolonial definition links nationalism to imperialism and to the response of the colonised to colonial misrepresentation of the natives. Part of nation-building is all about pulling down the structures of these misrepresentations, rewriting the nation's own history and reconstructing its own identity. It is very interesting to note that whether it is political or cultural or postcolonial. The political definition talks about the nation as an instrument of development; the cultural talks about it as the product of print capitalism, and the postcolonial talks about colonial and postcolonial constructs of identities. However, though the nation may be imagined, it is always conceived as a deep, horizontal comradeship which has the ability to rouse unlikely peoples in dramatically unlikely conditions in an impassioned chorus of voluntary co-operation and sacrifice. Ultimately it is this fraternity that made it possible, over the past two centuries, for so many millions of people, not so much to kill, as willingly to die for such imaginings. That is why I don't agree with people who say nationalism is passe, or worse, a lot of hot air. Nationalism has different effects and meanings in a peripheral postcolonial nation compared to a world power although American freedom fries can still make patriotism fashionable again. For Third World and developing countries, nation-states are still the best sites for progress and modernity. Nation-building especially in the post independence context is an important process in the quest for progress and development. National policies and programmes can be directed towards national integration. Many things can be done to forge nations out of diverse human material. You could institute a national language as a powerful symbol of cultural unity where there is linguistic diversity. You could plan a homogenisation programme through mass education and the print-media because the printed word can disseminate identical information to a potentially unlimited audience.You could use the electronic media to standardise representations and language so that it could play a crucial role in the reproduction and consolidation of nationalist sentiments. To build an imagined community you need a structure capable of maintaining cohesion and loyalty among citizens in an abstract and anonymous manner. National symbols can be set to work in mysterious ways on our psyche. For instance, the Tugu Negara, the national monument for the country's fallen heroes, has the power to inspire patriotic national imaginings. The map of the country on the classroom wall tells your students that their nation is simultaneously a bounded observable thing and an abstraction of something which has physical reality. Other symbols that work this way are the national anthem, national heroes, the national flag, the national flower and the national car, among others. All these are symbols you can construct to create organic solidarity. Language and literature, the mother of all symbols, can likewise help build a nation, by working on the landscape of the mind. The genre of fiction, in particular, as an instrument of representation could help define the nation by imitating its structure and objectifying the unity in diversity of national life. And because it tells the common story of the common people in the common language, this genre usually carries populist undercurrents of national thought. Vision 2020 is another structure for a united Malaysian nation. Bangsa Malaysia can be constructed in discourse over time using such identity-markers that will set us apart from the rest of the world. Or we can choose to simply evolve. In which case, we are no longer masters of our own destiny. * Zawiah Yahya is chairman of SoLLs.INTEC.03 and professor of Postcolonial Studies and Critical Theory at the School of Language Studies, Faculty of Social Sciences and Humanities, Universiti Kebangsaan Malaysia. Background Malaysia's strategic position between the Indian Ocean and the South China Sea has long been a meeting and transitional place for traders and travellers from West to East and vice versa. As a result of that, Malaysia's history is one of continual interaction with foreign powers and influences. Hindu-Buddhist influence was strong in the centuries before the coming of Islam as evident in Kedah's Bujang Valley. By 1400, when the Malacca Malay Kingdom was at the height of its power, Islam had become a major influence. By 1511, however, Malacca had fallen to the Portuguese. Meanwhile the Dutch had been establishing their influence and presence in Java. By 1641, the Dutch had also taken over Malacca but they in turn lost it to the British who had been slowly consolidating their hold on the Malay states, following Francis Light's arrival in Penang in 1786. By 1815 Malacca was in British hands and in 1819, Stamford Raffles founded Singapore. Thereafter, through treaties, relentless political pressure and diplomacy, the British slowly extended their control over all the states of the Malay peninsula. Sarawak, once part of the Sultan of Brunei's Empire, had been ruled since 1841 by a British adventurer named James Brooke and his descendants. In 1888, Sarawak and North Borneo (Sabah) became British protectorates. By the 1920s, all the states that eventually comprised Malaysia were under British control. The first stirrings of Malaysian nationalism were felt in the 1930s and following the end of World War II, the momentum of nationalism picked up again, culminating in independence for the Federation of Malaya in 1957 and the formation of Malaysia in 1963. We are not Westernized. We are very Filipino. Maka-Diyos... blah blah blah. We are hyper-sensitive. With a foreword from our friend Bert M Drona who sent this article to me. "What nationalism? What I sense is more like being in the process. Me then am going to be a nationalist, if we can get past our debts and the TRAPOS." - Ogie. I agree with you. It is really sad and enraging. We oftentimes say it's "our/everyone's" fault, but strictly speaking, as you alluded to, much of the present predicament, i.e. foreign debt, etc. is due to leadership, who has the power to decide and act on national issues/governing. The question that follows is how can or do we change this leadership, when the rules of the game, i.e. elections, legislature, judiciary,etc are made and controlled by them? It's improbable to attain that change by peaceful means. A bloody revolution is needed, we add but to be successful it may have to wait till a larger portion of the citizenry has understood the "whys" for one and thus act united to realize its success. That's where raising the national consciousness comes in. But of course a revolution is no guarantee, it only offers an opportunity for fundamental changes. Thus again, the requisite for knowing and understanding before acting. For now, we'll just have to talk about it and hopefully we can make others aware; it may take our lifetime doing so. But let's think of the next generations so we do not see our present discussion/exchange as a futile exercise.